The kitchen is one of the best rooms in the home to remodel because of the incredible products that go into creating the space. Whether it’s taking advantage of a tight budget or designing a dream kitchen, the experts at ProSource® of Boston South love to partner with you to help find the right products for your project. We offer design advice and we leverage our 145 location network to sell products at low, wholesale prices. Learn more about the different products we offer for a kitchen remodel project. 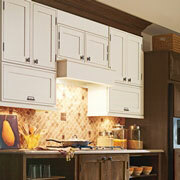 The wood type, finish, and style of cabinets are a focal point for kitchen remodel projects. Defining the entire feel of a kitchen, leverage a variety of storage and style options to help you find the right cabinets. 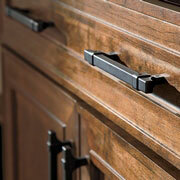 The cabinet door, color, and style are a good start for cabinet design and use, but cabinet hardware finishes the look. ProSource has a vast collection of hardware pieces, from traditional knobs to handles designed with an artists’ feel. 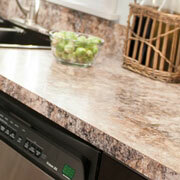 Kitchen countertops are made from a variety of materials, each delivering a different style and function. From granite to quartz to blended or recycled materials, ProSource has countertops of all materials, colors, and finishes that connect both design and use. When it’s time to wash up, it’s time to have an awesome sink. Kitchen sinks help keep the home running cleanly and smoothly. 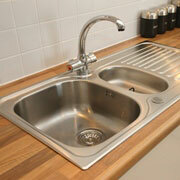 In our ProSource showroom, will find sinks made for different styles and purposes. For example, you can find a single-, double-, or triple-bowl sink with unique faucet configurations for easy use. Ah, the kitchen faucet. What a wonderful way to make the kitchen easier to use. Multiple faucet functions help make clean up easier, which is always appreciated in the kitchen. Our store has different faucet styles, colors, and functions that fit into any design. 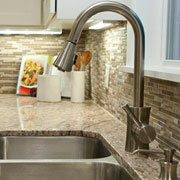 Style and ease of use are mandatory for kitchen faucets.